A special place, where a fine balance is kept between preserving the farm village character and its country life charm, but where sustainable and environmentally-friendly development is pursued providing a safe and secure haven, which is well managed, has a good infrastructure and is known for its friendliness and diversity of people. Here we have local farmers and business people, professionals, retirees, artists, crafters, and those just living here just for the joy that simple country living can bring. 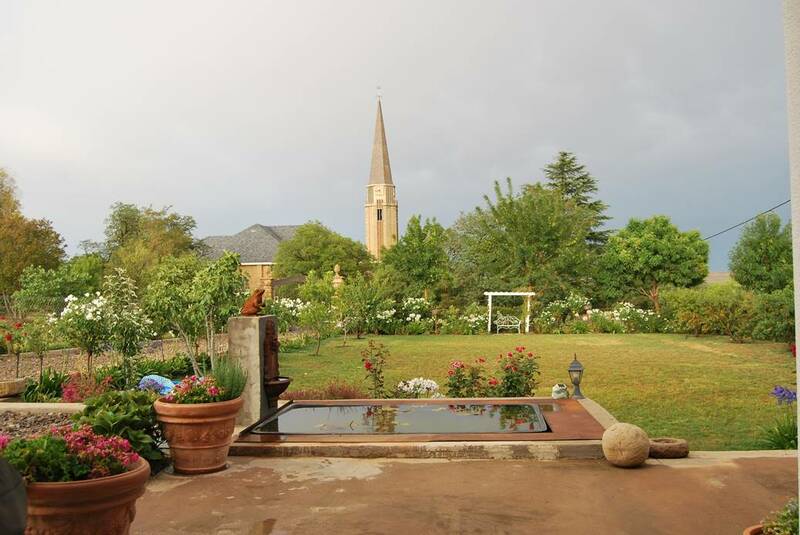 Residents proudly bring friends to visit the village, but if you are looking for accommodation, the village has the Dunlin B&B, and the Rosenhof Exclusive Country Lodge. Primarily, the Village is a place where one can truly relax. But there are a host of activities to keep one busy such as Hiking – the famous Holhoek Hiking Trail where one can see bushman caves and their art. Visiting the dinosaur fossil foot prints either by 4 x 4 or as a hike. Gently strolling along the village trail for those that are not serious hikers. Taking morning coffee or sundown drinks on the koppie above the village. Kids can safely ride their bicycles. Excellent fishing, bird watching and geological sites are in the vicinity. Partake of an excellent meal and friendship at the Pink Tricycle Tea Room and Dino’s Antiques and Restaurant, a great base for off-road biking and popular for classic car clubs. The village has an active residents forum that is involved in activities to promote the vision of the village and to encourage people to join in arranged activities and social life, and the village is also a registered conservancy. During the 89th annual meeting of WESSA (Wildlife Environment Society of South Africa) the forum was awarded the WESSA national group award in recognition of the excellent work taken by the group for the benefit of environmental conservation in their community, through action taken to ensure compliance with environmental legislation. The Village has several artists including Rose-Marie Schütze, Edward van den Berg, Peter van Reenen, Nanna Brits, Wiets van Rensburg and Anton Grové. The Uniondale Game Farm has dinosaur footprints dating back many millions of years.